Publication of scientific work and its proper transmission to scientific community, researchers and general public needs certain Ethical Standards to be followed. These standards ensure that credit of high quality scientific work goes to the people who have generated that idea and worked for it. This is also necessary to win public trust in scientific findings. 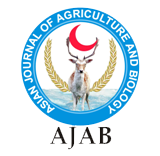 Asian Journal of Agriculture and Biology (AJAB) abides by Code of Conduct of the Committee on Publication Ethics (COPE) and aims to adhere to its Best Practice Guidelines. AJAB is committed to publishing only original material, i.e., material that has neither been published elsewhere, nor is under review elsewhere. AJAB uses the Turnitin software to detect instances of overlapping and similar text in submitted manuscripts. Manuscripts that are found to have been plagiarized from a manuscript by other authors, whether published or unpublished, will incur plagiarism sanctions. Immediate rejection of every other manuscript submitted to AJAB by any of the authors of the infringing manuscript. Prohibition against all of the authors for any new submissions to AJAB, either individually or in combination with other authors of the infringing manuscript, as well as in combination with any other authors. This prohibition will be imposed for a minimum of 36 months. Prohibition against all of the authors from serving on the Editorial Board of AJAB. In cases where the violations of the above policies are found to be particularly flagrant, the publisher reserves the right to impose additional sanctions beyond those described above.